putting the young shrimp into freshwater and raise them there. Breeding these shrimp involves quite a bit of work. This should, however, not prevent anybody from trying! This report should provide anybody interested in breeding these fascinating shrimp with guidelines to work along – there’s no panacea for that, after all. We used all the brands we mention in this report, however, there are of course many other brands that are as good and as suitable. We have written this breeding report in combination with our breeding video. We detected and observed so many details that they would go beyond the scope of this report. Thus, please watch our video and study the development of the larvae. Have fun reading, and good luck for your breeding attempts! First of all, you’ll need an aquarium. In our case, we were using a 60 litre tank by Juwel. The future will show whether a smaller tank will also do. You can’t do without a heater, a thermometer and an air pump. Differently from the method for breeding Caridina japonica, the air pump is not only used for aeration, but drives an undergravel filter. Without a filter, it is hardly possible to maintain the aquatic environment in a stable condition. We used shrimp gravel by Dennerle as a substrate. We made the best experiences with live phytoplankton as food, as well as Liquizell and, later on, something a bit coarser like e.g. fluid Artemia food by JBL. Marine salt – Reef Salt by Aqua Medic – was used to prepare brackish water. In our case, we chose a concentration of 28 g/l, i.e. just under seawater concentration. We checked our water with test sticks by Oase once a week. the parameters were constant: pH 7.6 – 8.0, GH 21, KH 10 – 15, NO2 0, NO3 0. The brackish tank should cycle for a good four weeks. It is lit for 11 hours a day. During this time, suitable bacteria and algae can develop. When the preparations are completed and the breeding tank has cycled we’re ready to rumble. We siphoned the larvae out of their freshwater tank and put them into brackish water. Immediately after the larvae have been put into the brackish tank you can start feeding. During the first three weeks, we fed phytoplankton almost exclusively, four times a day, dosage to our feeling. You best dose the phytoplankton with a pipette. Even though we fed quite generously, the water never turned really greenish-turbid. When they are in their fourth week, the larvae can cling onto smaller food particles. Once you notice this development, it is time to use a coarser fluid food in addition. 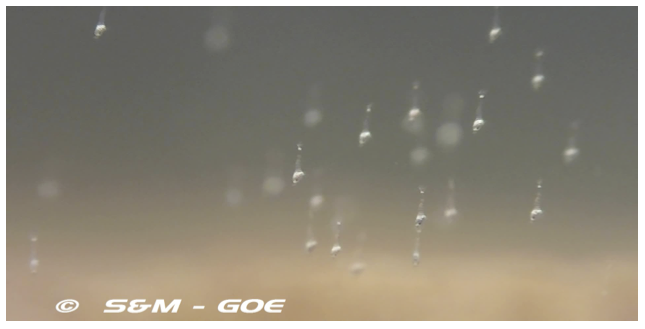 In the meantime, sufficient algae ought to have developed on the glass, the equipment in the tank and the substrate. 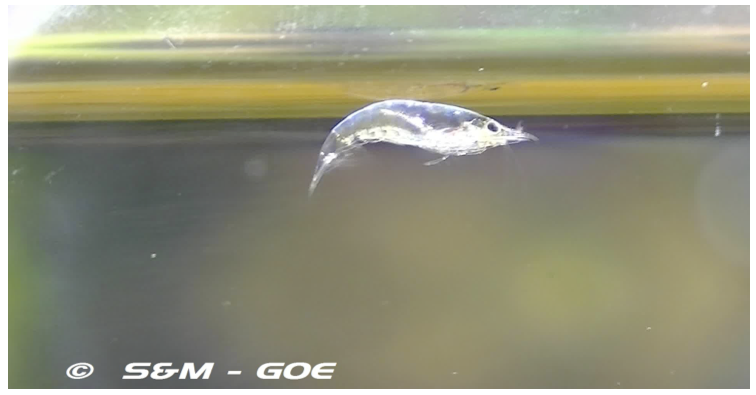 If you observe the larvae (which ought to have visibly grown by that time) grazing on the bottom, the glass or the equipment, you can start feeding some powdered food or CyclopEeze in addition, however, go easy and feed only small amouts. After what feels like almost an eternity you can see that the larvae approach a stage that looks almost like a fully developed shrimp. They change from an upright floating position to horizontal swimming, and they are especially active by night. During the day they live in hiding, just like their parents do. As we did not have any data as to when to put them into freshwater we had to go with trial and error. We would, however, like to spare you (and your shrimp!) this method. Fill a container with brackish water from your breeding tank (water height is up to you) and put your shrimp in. Add a bit of fresh water from the tank they’re destined to go into every 30 minutes or so until the amount of fresh water is double the amount of the brackish water from the breeding tank. Those who want to make 100% sure that everything works out leave the container for 24 hours (aerated, of course), and watches how the shrimp do. If they continue to do fine they are ready to go to a freshwater tank. Now you’ll just have to feed the small fan shrimp well in the freshwater tank. We did not have any data for this step either. We took a high risk, relying on the fact that a well-cycled tank is an intact biological system with a functional microfauna and -flora. 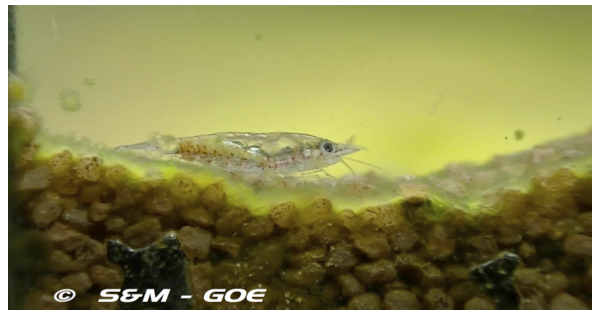 We were right – our fan shrimp offspring are around 1.5 cm long by now. We only fed the parents, and if the offspring ate that food it was mainly secondary. We filter this tank with a JBL CristalProfi i200. The small shrimp were able to enter it, however, they weren’t hurt or killed. The problem with this filter is the space between glass and filter. It is so large that the shrimplets can get in, but they’re unable to get out again. This fact cost some of the shrimplets their life, thus we cannot recommend this filter for this purpose without reservations. Contrary to some data you can find on the Internet the development of Atya gabonensis does not only take a mere 4 weeks. 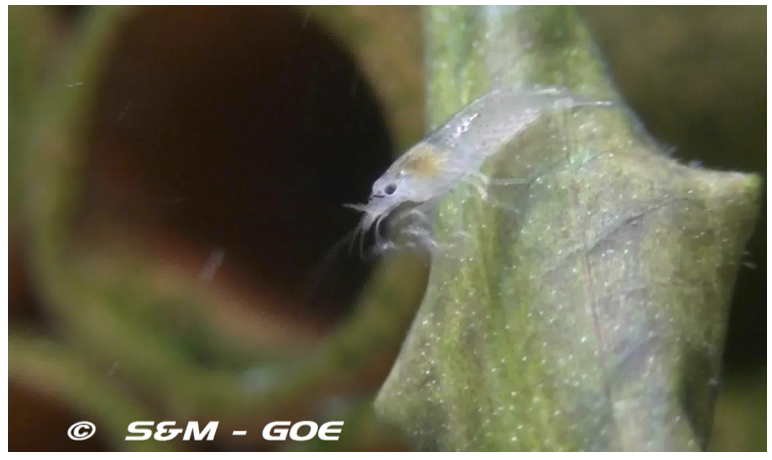 Our larvae took 3.5 to 4 months to develop into adult shrimp, i.e. a good 120 days. Some time ago, we learned that no grown Atya gabonensis are imported any more – not on purpose, but simply because there are none any more! Whether this is really true – we don’t know. However, the shrimp we found in pet stores were all small to medium-sized. Our fears were confirmed. If this development continues you can easily imagine how it’s going to end. Our intention has always been to contribute a small bit to help this species to survive in its natural habitat, to make wild-caught Atya gabonensis superfluous. Now it’s up to us all, and we wish anybody who tries their hand at breeding these fascinating shrimp good luck and lots of success. geez, i was trying to decide between the bamboo shrimp and the vampire when I found this article, now I really want to get the vampires and try to breed them too! Thanks for this article!